So if you’re reading this, you may be asking yourself “Why does this guy want to be a VIP BbWorld Blogger?” This could be because you honestly want to know, or you just may be reading the title of my Blog post out loud. 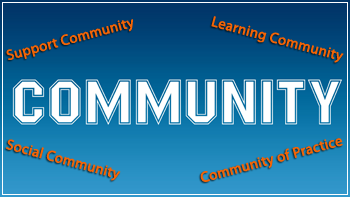 Regardless of why you are asking yourself that question (or just reading), I’ll tell you in one word… Community. My name is Jacob Spradlin, I am the Assistant Director of Training and Development for the department that handles Distance Education at Sam Houston State University in Huntsville Texas. I hold a Master’s in Instructional Technology and have over 15 years experience in the field. I have worked with Blackboard in one form or another since 2000. My current job involves online course development as well as training for faculty here at SHSU. For a long time, (I believe that 1 eLearning year is like 7 regular years) I have been interested in building community on my campus when it comes to eLearning. I started our first local Blackboard users group back in the early double oughts and learned first-hand how powerful it was to put people together so they can learn from each other. Getting 2 English faculty in same room or even cross-pollinating the disciplines lead to wonderful discussions and discoveries. Your Learning Community is the obvious choice in that you try to make your course(s) a community of learning. You might think of it as the “Guide on the Side on Steroids”, where your students with equal parts professor interaction, feedback and prompting; interact with each other, reflect and build upon the knowledge and skills that they are learning. The Support Community is now almost the gold standard for eLearning, where you use the Tool to support the tool. Whether it is a Faculty Resource course or a Student Orientation course, you leverage the technology so that they practice using it to find the answers they need. Our most recent accomplishment at my institution is the beginnings of an Online Certification process where the faculty use the online tools to learn and become certified to teach online. Social (insert concept here) seems to be the buzzword these days. It is easy to say I don’t want my course to be like Facebook or Twitter, but is is harder to ask yourself “how are my students communicating?” or “where are they living digitally?”. A Social Community gives your students a sense of home away from home and for online students it creates a connection with the university that helps fight off the “I’m just a lonely student taking courses on the Internet” syndrome. Communities of Practice have found a home in the eLearning spectrum. Departments, divisions and other constituencies share professional learning, documentation and knowledge base resources by using this vehicle. Content Repositories are tremendous assets for these communities. So, “Is he going to get around to why he wants to be a VIP BbWorld blogger?” Don’t worry I am, I just wanted to provide some context. What better community to interact and learn from than the BbWorld community? What better event to foster innovation, creative design and fundamentally shifting the way we communicate than BbWorld 2012? Hundreds of sessions will taking place that will expand our community of support. Thousands of people will attend who will grow our social community. Ideas, resources and conversations will take place that will add to our community of practice. This event encompasses exponentially one of the largest learning communities in the world. So instead of asking why I would want to be there, it might be better to ask why I wouldn’t want to be there?! Not only will i be recording for posterity my observations of a awesome event, I will also be communicating to my eLearning communities and reflecting my experience so that others can take part. So here i am begging the eLearning gods to, tearing my educational sack cloth, wailing and gnashing my teeth…Please let me be a VIP BbWorld Blogger this year so that I can communicate about the community that I love so much!